The FDA is updating its position on OTC sunscreens, and according to the new proposal, several popular ingredients require more data. Guidelines do, however, note that zinc oxide and titanium oxide are safe to use. The FDA evaluated 16 sunscreen ingredients and determined that 12 of them should be required to submit additional safety data. Two ingredients—PABA and trolamine salicylate—are considered unsafe for sunscreen. “Since the initial evaluation of these products, we know much more about the effects of the sun and about sunscreen’s absorption through the skin,” FDA Commissioner Dr. Scott Gottlieb says in a statement. While largely supportive of the FDA’s new proposal and efforts to educate consumers about sunscreen use, top dermatologists worry it does not go far enough and fails to make it easier for new ingredients to be approved. 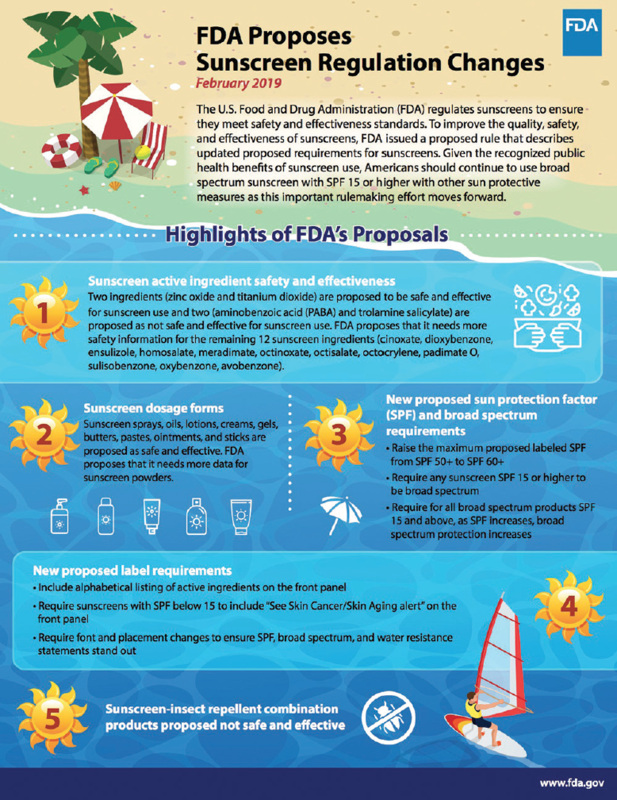 The FDA also proposed updates on sunscreen safety, sun protection factor (SPF) requirements, and the effectiveness of insect repellent/sunscreen combinations. The maximum sun protection factor on sunscreen labels would be raised from SPF 50+ to SPF 60+. Sunscreens with SPF values of 15 and higher will be required to be broad-spectrum, and broad-spectrum protection against ultraviolet A radiation must also increase as SPF increases. New sunscreen label requirements will include a list of active ingredients on the front of the bottle. Products that combine sunscreens with insect repellents are not generally considered safe and effective. Sunscreen lotions, sprays, oils, creams, gels, butters, pastes, ointments, and sticks offer proven protection. Wipes, towelettes, washes, shampoos, and other forms of sunscreen must now be categorized as new drugs because the FDA has not seen data showing efficacy. Powder sunscreens may be effective, but more safety and efficacy data is needed. The new proposal may not go far enough, says Heidi A. Waldorf, MD, a dermatologist in private practice in Nanuet, NY and an Associate Clinical Professor of Dermatology at Mount Sinai Hospital in New York City. In addition to the two ingredients considered unsafe, there will be 12 additional chemicals listed as having unknown safety, including some that are very commonly used. “It won’t keep any from being used. It just suggests more investigation,” she notes. The FDA has asked the sunscreen industry to conduct additional testing on products with these ingredients. The new legislation will help give consumers better information on the sunscreens that they are using, adds Joshua Zeichner, MD, Director of Cosmetic and Clinical Research, Department of Dermatology at The Mount Sinai Hospital in New York City. “Proper use of sunscreen is one of the most important ways that we can protect ourselves against the development of skin cancers, so I support any new FDA actions that help educate consumers on their use,” he says. The FDA has approved Tremfya One-Press, a single-dose, patient-controlled injector for adults with moderate to severe plaque psoriasis. Tremfya (guselkumab) from the Janssen Pharmaceutical Companies of Johnson & Johnson is the first medication of its kind to offer the One-Press patient-controlled injector. It fits comfortably in the hand and offers a controlled injection that hides the needle. Tremfya is administered as a 100mg subcutaneous injection once every eight weeks, after starter doses at weeks 0 and 4. Tremfya is intended for use under the supervision of a physician, and patients may self-inject with Tremfya One-Press after physician approval and proper training. The design of One-Press allows patients to control the rate and pressure of their injection. A soft click indicates when administration is complete, resulting in nearly 99 percent of patients reporting a successful first injection. One-Press also includes a safety system that protects the needle after use. The American Academy of Dermatology’s (AAD) new officers and board of directors took the helm at the conclusion of the 2019 AAD Annual Meeting in Washington. Members hold the same positions for the American Academy of Dermatology Association, a sister organization to the AAD. George J. Hruza, MD, MBA, FAAD, the new AAD president, is an adjunct professor of dermatology at St. Louis University. Jane M. Grant-Kels, MD, FAAD, vice president, is a professor of dermatology, pathology and pediatrics; vice chair of the department of dermatology; director of the cutaneous oncology center and melanoma program; and founding chair emeritus of the dermatology department, dermatology residency program and dermatopathology lab at UConn Health in Farmington, CT.
Marta J. Van Beek, MD, MPH, FAAD began her three-year term as secretary-treasurer. Dr. Van Beek is the chief of staff for University of Iowa Hospitals & Clinics in Iowa City, Iowa, as well as the C. William Hanke Professor of Dermatologic Surgery and director of the dermatologic surgery division at the UI Carver College of Medicine. Daniel D. Bennett, MD, FAAD started his three-year term as assistant secretary-treasurer. He is an associate professor and vice chair of clinical affairs in the department of dermatology at the University of Wisconsin-Madison School of Medicine and Public Health. New board of directors members are Lawrence J. Green, MD, FAAD; Adelaide A. Hebert, MD, FAAD; Alexander Miller, MD, FAAD; and Cyndi J. Yag-Howard, MD, FAAD. 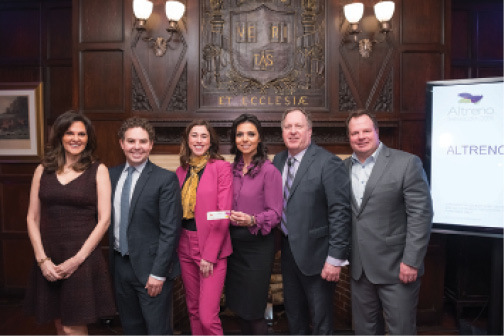 As part of the launch of Altreno (tretinoin) Lotion, 0.05% from Ortho Dermatologics, dermatologists Doris Day, MD and Joshua Zeichner, MD and colleagues spoke at the Harvard Club in New York City earlier this year. Altreno is indicated for the treatment of acne, and its formulation may be especially appealing to adults. Estimates suggest that nearly four times as many women suffer from acne as men. Altreno Lotion is the first and only tretinoin lotion, and it was designed with women in mind, because it provides efficacy, tolerability, and once-daily dosing in an elegant lotion formulation to help achieve beautiful skin by working to treat their acne. 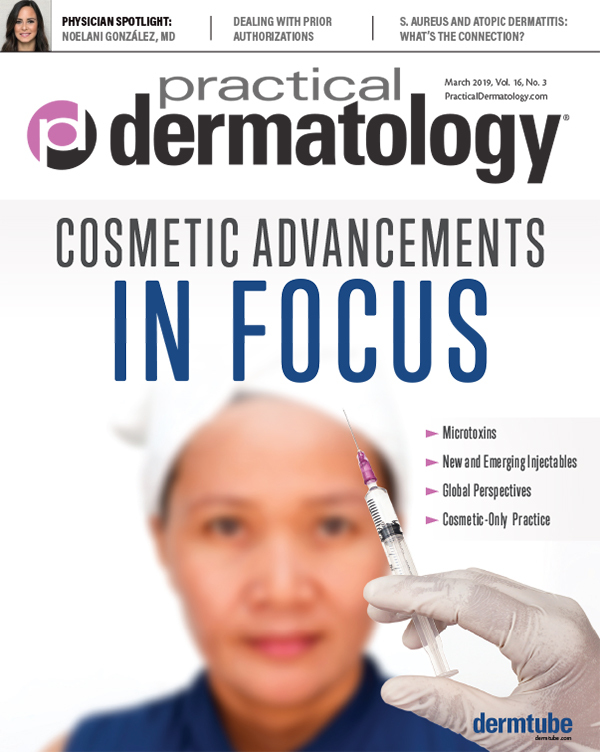 In keeping with the theme of the piece, which is focused on collaboration between PAs or NPs and dermatologists, the statement that, “the NP and PA may independently see patients and maintain their own schedule,” was intended to indicate that the established PA or NP likely will not need to see each patient side-by-side with the supervising dermatologist. It was not intended to suggest that these individuals will establish individual practices. It is essential that all parties be aware of and adhere to scope of practice and supervision requirements, which are established at the state level. It’s been about a decade since any new neuromodulators came to market in the US, which is why enthusiasm about Evolus’ Jeuveau is so palpable. 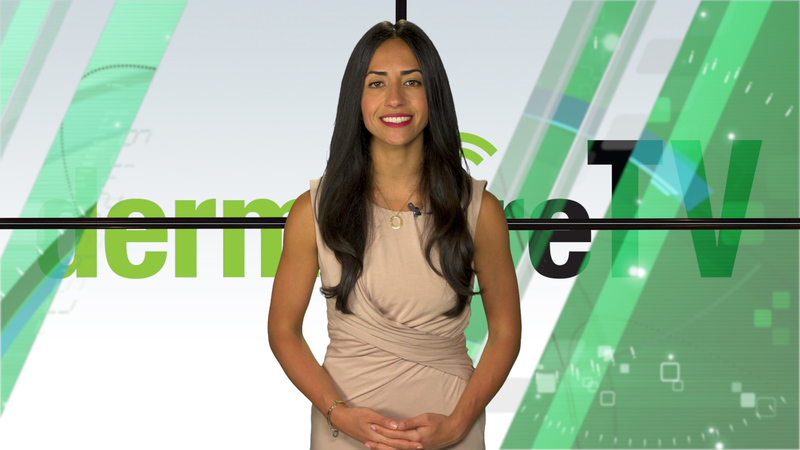 The 900kDA neurotoxin scored the coveted FDA nod in early 2019 for smoothing glabellar lines and is expected to be available in physicians’ offices this spring. David Moatazedi, Evolus Chief Executive Officer, and Michael Jafar, Evolus Chief Marketing Officer, spoke with Practical Dermatology® about what we can expect from Evolus and the company’s plan to build a portfolio of products designed specifically for aesthetics. David Moatazedi and Michael Jafar: Evolus is the first company in nearly a decade to enter the fast-growing US aesthetic neurotoxin market. We are excited to launch a new chapter in aesthetics with the recent FDA approval of Jeuveau. It is the first-known FDA approved 900kDA neurotoxin in the US since Botox Cosmetic and the first neurotoxin dedicated exclusively to aesthetics. Jeuveau was designed specifically to go head-to-head with Botox. Jeuveau will be available at physician offices in Spring 2019. We are planning for a high-impact, disruptive launch of Jeuveau powered by our technology platform designed to eliminate the friction points that exist for customers today. Mr. Moatazedi and Mr. Jafar: Jeuveau will be introduced as a new toxin with a fresh new look, and Evolus is strategically focused on tapping into the millennial mindset, which will be reflected in the company’s approachable communication style, campaign assets, and core brand DNA. Mr. Moatazedi and Mr. Jafar: Our manufacturing partner is Daewoong Pharmaceuticals, which is one of the largest pharmaceutical companies in South Korea. We have a great, long-standing relationship with Daewoong. Working with our partners in South Korea has been a collaborative experience. We built a modern, state-of-the-art, Good Manufacturing Practice (GMP)-compliant manufacturing facility that has allowed us control and oversight of the quality and safety standards in which Jeuveau is manufactured. Mr. Moatazedi and Mr. Jafar: We are committed to providing physicians and their patients with expanded choices in medical aesthetic treatments and procedures. Jeuveau is our first product launch that anchors us in this mission. Our goal is to not only grow the aesthetics market, but to also raise the bar for both physicians and their patients. We look forward to continuing to build a portfolio of products designed specifically for aesthetics. Mr. Moatazedi and Mr. Jafar: In May of 2018, a complete response letter (CRL) was issued with deficiencies isolated to chemistry, Manufacturing, and Controls (CMC) processes. (Editor’s note: at that time, the FDA rejected Evolus’ application.) No clinical, safety, or efficacy deficiencies were cited. We were able to address the questions quickly and resubmit ahead of our self-imposed timeline of 90 days, ultimately allowing us to move forward as planned. We completed our FDA re-submission in August 2018 and in the same month our Biologics License Application was accepted by the FDA and we were granted a six-month review. Everyone is talking about or using cannabidiol (CBD) oil to treat a laundry list of diseases, conditions and symptoms including dermatologic concerns such as psoriasis, atopic dermatitis, and wound healing, but little was known about dermatologists’ awareness of cannabinoids as therapeutics until know. Adam Friedman, MD, FAAD, Professor and Interim Chair of Dermatology and Director of the Residency Program and Translational Research at the George Washington University School of Medicine & Health Sciences in Washington, DC, and colleagues surveyed 531 dermatologists to get a better idea about their attitude and awareness on cannabinoids as therapeutics, and it turns out there’s a lot they need to learn. Why is this topic important to study? Dr. Friedman: Cannabinoids represent a broad class of plant, human, and synthetic bioactive agents which have tremendous reactivity in the living system, yet due to the negative social stigma and federal roadblocks, both our understanding and even more so, our translation to bedside has been undermined and therefore limited. We have a lot of catch up to do—work which will require more time and energy to even begin to keep pace with the exponentially increasing number of state approvals for both medical and recreational cannabis. Consumers and patients alike are interested and have questions. Physicians need to provide guidance and answers and therefore we wanted to assess dermatologists’ and dermatology providers’ comfort with and fund of knowledge on medical cannabinoids. Describe the research and your findings. Dr. Friedman: Our survey study revealed several key messages. First, dermatologists are being approached by their patients with questions on this subject matter, and this is more likely to occur in states where medical cannabis is legalized. Second, while more than 90 percent of respondents agreed that this is an important area for R&D and 85 percent thought medical cannabinoids should be legal, more than 80 percent were not comfortable with their understanding or knowledge on this subject matter, which is not surprising given 65 percent of respondents incorrectly responded that CBD has psychoactive effects. Dr. Friedman: First things first, let’s educate our colleagues on the current state of the science and practice. This is already starting to manifest. We need sessions at both local and national conferences as well as those who are ingrained in this field to publish, publish and publish. Next, we need industry to take interest, support investigators, and collaborate to bring new cannabinoid-based drugs to the market. This is a great opportunity for the broader dermatology community as a whole to unite under a common and novel goal. Wouldn’t it be great to have something new in the tool chest? Robinson ES, Murphy EC, Friedman AJ. Knowledge, attitudes, and perceptions of cannabinoids in the dermatology community. J Drugs Dermatol. 2018;17(12):1273-1278.